Q. David Bowers. Atlanta: Whitman Publishing, LLC, 2006. Price $69.95. �Rock Solid� is the only way I can equate the tastefully done new book by Q. David Bowers, Obsolete Paper Money Issued By Banks In The United States, 1782-1866. The issues that he focuses on are the state chartered bank issues of this period. Mention is also given to spurious (not meant to imitate the genuine) issues and counterfeit (meant to imitate the genuine) issues. Each of the 21 chapters is definitive in its coverage and well illustrated in that particular chapter�s topic. The foreword by Eric Newman, certainly considered one the deans of numismatic literature and known by paper money collectors as �The� authority on Colonial and Continental issues puts it aptly, �This is a book which was waiting to be written� and �this book should serve as a catalyst for further research and an essential reference for anyone interested in collecting American obsolete paper money�. David�s life in the numismatic fast lane is probably not news to most collectors of either coins or paper money. David became a professional numismatist as a teenager in 1953 and earned a B.A. degree in Finance at Pennsylvania State University. He is the author of more than 50 books and has received numerous awards in many facets of this hobby. His business has been numismatics and for the better part of my life his name has appeared and reappeared as one of, if not the foremost of the distinguished entrepreneurs in this field. He is a past president of the Professional Numismatists Guild and the American Numismatic Association. To list all of his numis-world achievements here is not in the scope of this review and certainly would be a challenge. David whets our interest immediately in the first chapter by priming us with the history of Colonial and Continental Paper Money and explaining all of the features appearing thereon. He touches on the issues of each state explaining the Acts that provided for the issuance and pointing out the earliest collectable issues. This chapter like all others is profusely illustrated and sets the tone of what is yet to come. 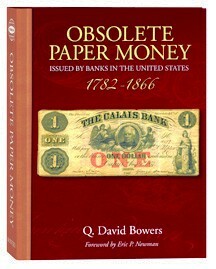 From here the author explains the world of Obsolete Bank Notes not only by speaking about the notes themselves but also about the banks of issue, the progression of engraving methods, the use of anti-counterfeiting devises and lives of the engravers and the lineage of the engraving companies terminating with the American Banknote Company. Within each chapter the author relates human interest events that are elaborated on without taking away from the main theme of this work. He delineates the political and financial atmosphere of the different decades of this note issuing period and explains the reasons sparking evolution in banking law. Obsolete paper money issues are often called �Broken Bank Notes�. Essentially they are regarded as one in the same. However to be explicit a broken bank note is really a note from a bank that failed and rarely one can see the obvious surcharge, �Broken Bank� stamped across the face or back of the note. Obsolete Bank Notes are issues that are no longer in use and have been demonetized or freed from any obligation that may be stated on such issue. All broken bank notes of this era are obsolete but not all obsolete notes are broken bank notes. Some of these institutions became National Banks and many may still offer to redeem their old issues. How is a person to know if a bill is good or possibly counterfeit? The author touches on this subject by explaining and listing the various Bank Note Reporters and Counterfeit Detectors. Bank note reporters list and describe in various ways the good issues of the day while the detectors described the fraudulent issues. Fraudulent issues could be either counterfeit, spurious or altered meaning a copy of a good note, a put- together note not appearing like the genuine or a good note that has been doctored to become a higher denomination or from another locality. One area not widely understood is addressed in the chapter, An Inside View of the Banknote Business. Here the author relates the tribulations of the bank note engraver William L. Ormsby who was a genius in the world of bank notes. Ormsby was a Connecticut native, born and raised in the village of Hampton. From his youth as a blacksmith he blossomed to become an engraver and mechanic, inventing various machines useful in the note printing trade. His success as a businessman however was somewhat compromised by his naivety and inability to produce an appreciable quantity of the product that itself was an ingenious invention. One chapter the astute collector should pay close attention to would be Chapter 20, Collecting and Enjoying Obsolete Bank Notes. This deals directly with the collecting of the notes themselves. The what, where and why to collect is addressed along with the types, styles and the relative availability of the various issues. To a collector this chapter delineates the reasons a collector enjoys the chase. Here the author touches on the reality of collecting in today�s market atmosphere and gives advice to neophytes regarding purchasing and avoiding pitfalls and in essence advising that �experience� gained from spending years observing while modestly building a collection perhaps with a certain theme may be the best learning tool one can hope for. By digesting the information in this book a new collector should be able to fast-forward to a certain comfort level that will enable him or her to enter the field with much of the basic information one would normally accrue after many years of active collecting. So what has the author done for us, for this segment of the hobby and. for the lay person?Widespread interest in collecting obsolete banknotes blossomed in the mid 1960�s. During the past 40 years many books, catalogues, pamphlets and monographs were published. Most were related to specific areas such as features appearing on the notes themselves. Others were price guides for specific notes. Some had to do with the engravings or engravers. Many were specialized issues dealing with notes from specific states. This work is not a price guide but a rock solid effort that brings together all the facets involved in the production and distribution of the banknote product. It highlights the important men and machines that were instrumental in this process. It relates stories of special banks and banking practices and touches on the era of �Wildcat Banking� that was especially prominent in the State of Michigan but also encountered in most of the other states. It walks the reader through the evolution of the technology witnessed by the ever increasing sophistication needed to produce a better product. The author has been able to gather between two covers the sum of all of the parts of obsolete banknote study. Each chapter could very well be a separate work but by uniting them he has been able to produce and insert the missing cornerstone of this hobby segment. The book reads like a course in numismatics and yet is as captivating as a novel. This book is the foundation anyone could build a collection on. It legitimizes and gives direction to this segment of the hobby and its followers as a distinct specialty group. One could say, �as Newman is to Colonial and Continental Currency and Huntoon is to National Currency so now is Bowers to Obsolete Paper Money. That is what this author has done for us!